They may focus on education, medical care, agriculture, housing, broadcasting or any field of human need. Such people have the passion and practical skills to translate their vision into reality. Bill explains some of the qualities that Ashoka look for in their Fellows. Emperor Ashoka initially threw himself into waging war against his neighbours, but he became horrified by the carnage. Converting to Buddhism, he dedicated himself to improving the quality of people’s lives. 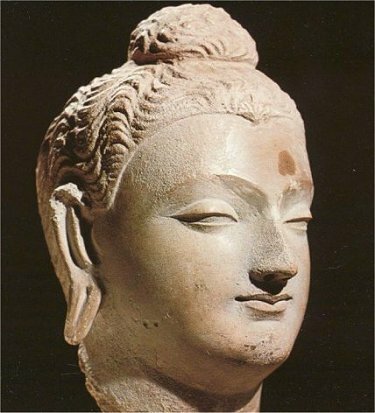 Deeply committed to his own beliefs, Ashoka nevertheless spread religious tolerance. Historians are split over the value of his legacy, but all agree that his reign produced great prosperity. “Amidst the tens of thousands of names of monarchs that crowd the columns of history the name of Ashoka shines, and shines almost alone, a star. “Both my parents showed extraordinary (most would say madly unrealistic!) freedom of spirit at 19. Public service and respect for ideas is a recurrent theme in both the American and Australian sides of my family. Looking back at his life, Bill recalls his own first encounters with entrepreneurship. Starting a one-page newspaper when at primary school, he soon built it into a 64 page publication supported by adverts. He said. “I can’t tell you how excited I was to get this mimeograph machine. It’s amazing how supportive my parents were. Susan Anthony – who fought for Women’s Rights. Maria Montessori – who created a new approach to helping children to learn. Mahatma Gandhi – whose spiritual leadership helped to guide India to independence. Florence Nightingale – whose work in the Crimean War helped to found modern nursing. Bill went on to study at Harvard, Oxford and Yale Law School. It was during a summer break at Harvard that he became gripped by the power of social change. Vinoba Bhave, a disciple of Gandhi, was walking across India, persuading individuals and whole villages to legally ‘gift’ their land to him. He then redistributed the land more equitably to support untouchables and other landless people. “Long before sunrise, we’d start walking across dividing paths of rice fields, by the moonlight, stars, and a couple of kerosene lanterns,” says Drayton. “At sunrise, thousands of surrounding villagers dressed in their best clothes began appearing in the horizon. Bill went on to organise Civil Rights sit-ins – an event he later described as one of the more formative experiences of his life. Pursuing his professional career, he worked at McKinsey, the consulting firm, and as an administrator at the White House during the Carter years. One of his key legacies was the carbon emission trading scheme. Whilst having a strong academic background himself, Bill believes it is now vital to help young people to develop other skills. These include empathy, problem solving and teamwork. Here he describes some of these qualities. Inspired by social entrepreneurs from the past, Bill decided to found Ashoka. It started with an annual budget of $50,000. This was seeded by the MacArthur Fellowship he was awarded. The budget has now grown to more than $30 million. The first Fellow was elected in India in 1981. Today it supports over 2000 Fellows in more than 60 countries across the world. It is funded by individuals, foundations and business entrepreneurs. It does not accept funding from government institutions. Bill disagrees strongly with the notion that ‘today there is less leadership in the world.’ He believes people are retaking charge of their lives – particularly in the citizen sector. Why? Older institutions no longer serve the emerging needs. “(The social sector) has been generating jobs at 2.5 to three times as fast as the rest of society. The U.S. more than doubled the number of IRS-recognized charities in a decade. Talent is flocking to the sector, says Bill, because people believe it is where they can make a positive difference. Certainly there is a place for pressuring old institutions to change, but it can be quicker to build successful prototypes. People are then more able to spot a need, make the new rules and deliver positive results. Let’s explore how Ashoka then aims to make these changes sustainable. Ashoka says: “We have designed an approach that offers critical interventions on three levels – the individual, the group, and the sector.” Let’s consider these three themes. “Social entrepreneurs are the engines of social change and role models for the citizen sector,” says Ashoka. It provides such people with a living stipend, often for 3 years. This allows them to work full-time on implementing their idea. Additionally it provides them with ‘entrepreneur-to-entrepreneur’ support and access to expert advice. The Fellow also becomes part of the organisation’s wider community for life. 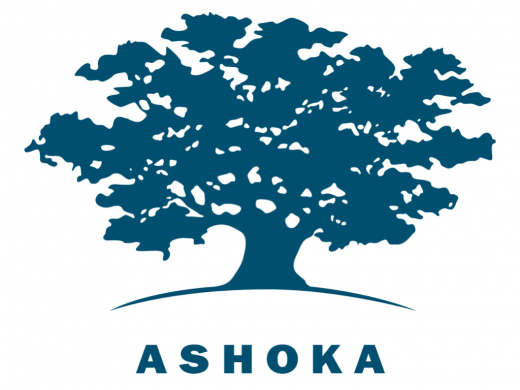 Ashoka spends a considerable amount of time selecting its Fellows. It looks for five qualities in such people. 1) They must have a new idea – this is The Knockout Test. The person must be possessed by a new idea. It must be a new approach to a social problem that will make a breakthrough in a particular field. “As a child, Joaquín’s garden was a refuge from the world and a space to explore his imagination. “After his mother married a Swedish businessman who worked in the Amazon, Joaquín spent his summer vacations in the jungle, which further inspired his creativity. “There, he also became friends with a young Shipibo indigenous boy who shared adventures with him and inspired his early interest in the role of children in the environment. “After returning to Peru and working in a variety of public, private, and nonprofit jobs, Joaquín attended Yale University and earned his master’s degree in environmental management. “He traveled to Bolivia to study the role of indigenous children in community development for his thesis project, an experience that affirmed his conviction to work in youth environmental conservation. Joaquín’s idea passed The Knockout Test. The organisation he leads aims to increase children’s appreciation of nature and equip them with practical skills to sustain their environment in the future. Many of these areas go on to be actually managed by the young people. 2) They must have creativity. Creativity obviously comes in different forms. Ashoka is looking for people who can beyond their original idea and find creative solutions on the road to success. 3) They must have entrepreneurial quality. Great entrepreneurs get the right balance between Innovation, Implementation and Impact. They start by having an innovative idea, but this is only the start. They want to implement the idea and make a positive impact. Ashoka’s entrepreneurs are possessed by their vision and want to translate it into reality. They are dreamers who do and deliver. 4) They must have an idea that has social impact. Ashoka focuses on the candidate’s idea – not just the candidate. The idea must be able to live beyond the person’s involvement. “Marie’s program encourages mothers to spearhead the development of a beautiful and healthy urban environment of new parks and green spaces. “Her program provides training and leadership-building seminars for women so they can effectively launch their own neighborhood campaigns. 5) They must have ethical fiber. Social entrepreneurs must have an internal moral compass. This is called into action on many occasions. First, when they face setbacks. Can they revisit their inner values and make decisions based on this compass? Third, when they experience pressure or personal attacks. The candidate must then be seen to behave ethically in every way. 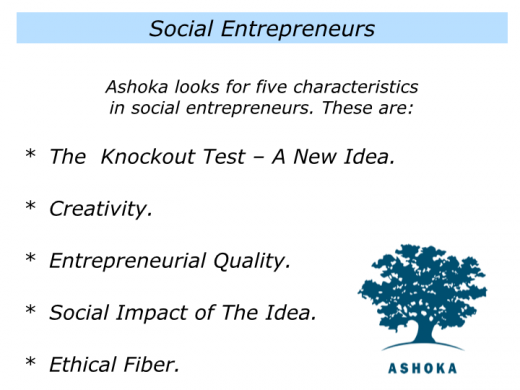 Ashoka uses these five tests to judge whether a potential Fellow has the ability to be a successful social entrepreneur. To link together to create effective action. 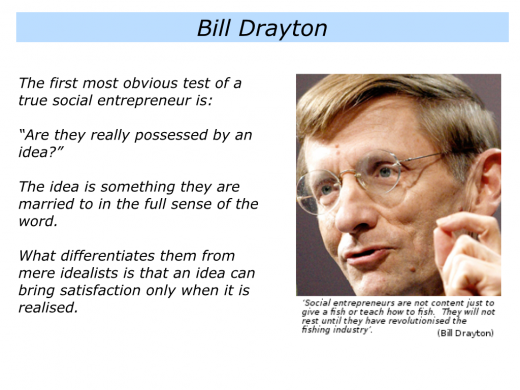 Bill Drayton believes this is a vital step in sustaining change. Why? The old institutions support the old ideas, but there is little support for the new ideas. The complete Ashoka model is therefore: a) To support social entrepreneurs; b) To promote group entrepreneurship; c) To build the infrastructures that support the citizen sector. Ashoka tackles the infrastructure issue on several fronts. This includes providing seed financing and building bridges to the business and academic sectors. The organisation has also developed mutually rewarding relationships with companies such as McKinsey, Hill & Knowlton and Ernst & Young. Engaging major financial institutions, including private, investment, and commercial banks, to provide alternative sources of capital. Creating financial models such as SIV (Social Investing Ventures) to allow the movement of these cutting edge ideas to scale. Assisting other philanthropic groups and Ashoka Fellows to secure investment through non-traditional avenues. Ashoka has a clear philosophy and principles, so let’s explore how these work out in practice. This is the organisation’s vision – so what is the reality? Between 50% and 60% of the Fellows change national policy in their respective countries. Ninety percent see independent institutions copy their ideas. This is a remarkable bottom-line in any language. David Bornstein features some of these changemakers in his book How To Change The World: Social Entrepreneurs and the Power of New Ideas. Whilst not solely about Ashoka, the book highlights the work of many of its Fellows. 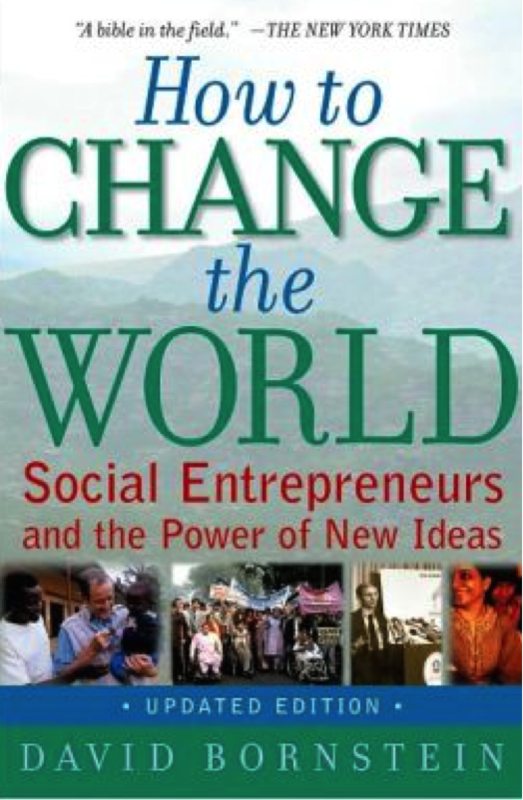 He also cites Ashoka as the organisation that has pioneered the way in social entrepreneurship. 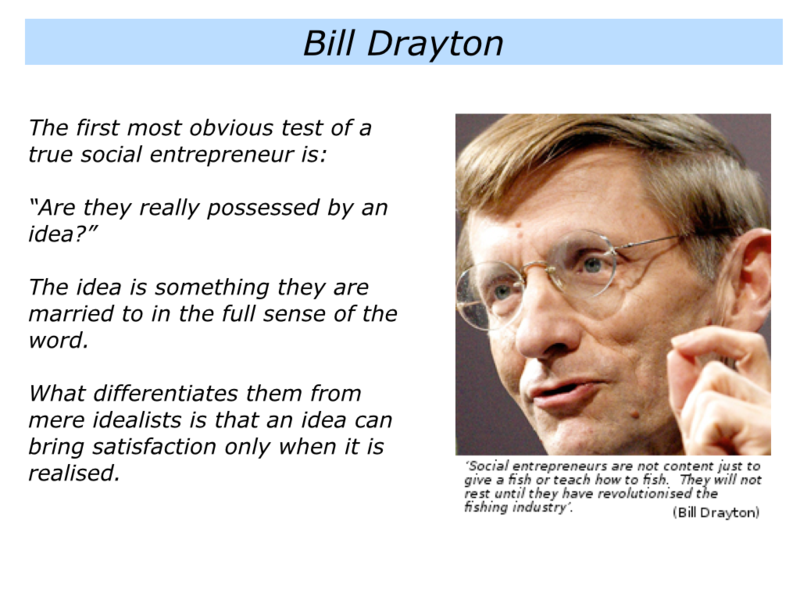 Bill Drayton is optimistic about the future. Outlining his view of the part Ashoka can play in history, he told the US News and World Report. “I have never doubted that we are serving the most powerful and most hopeful historical force of our era. Or that we are positioned to play a truly important role. We are, after all, a community of most of the world’s leading social entrepreneurs. “In the world ten years from now, it will not be possible to be a citizen without being a change-maker. Anyone who is not will feel themselves to be enormously vulnerable.